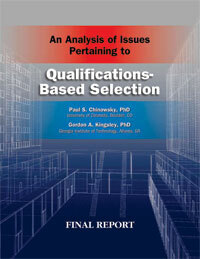 Public agencies that use Qualifications-Based Selection (QBS) to procure architectural and engineering (A/E) services are better able to control construction costs and achieve a consistently high degree of project satisfaction than those using other procurement methods, according to a two-year study led by Paul S. Chinowsky, PhD of the University of Colorado and Gordon A. Kingsley, PhD of Georgia Tech. The authors, both experts and noted researchers in the engineering and construction field, contend that QBS should continue to be the procurement method of choice for public contracting officers seeking to acquire A/E services to meet increasingly challenging infrastructure needs. This document is available for immediate download in PDF format.